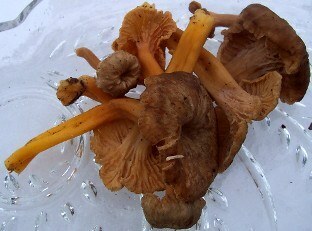 The Yellowfoot Chanterelle (cantharellus tubaeformis) is a very popular mushroom and versatile. It is known as the winter mushroom or winter chanterelle. Yellowish-brown, trumpet-shaped, sometimes hollow fruiting body, and blunt-edged widely spaced gills. It is a delicate and smaller version of the fall chanterelle. Chanterelles in general go well with eggs, curry, chicken, pork, fish, beef and veal, can be used as toppings on pizzas, be stewed, marinated, sauteed in olive oil, or used as filling for stuffed crêpes. Of course these are just examples; chanterelles are versatile and can be added as an ingredient to most dishes. They grow along Oregon and California coasts. This is a perishable item and it must be refrigerated upon arrival. We suggest putting them into a strainer in the product compartment in your refrigerator. Do not store in plastic, they need air circulation. Also try our dried yellowfoot!